Guthrie CSD & King County Consolidated Library is proud to offer you best-selling and classic eBooks, digital audiobooks, magazines, newspapers and streaming video available 24/7 from the library’s brand new digital collection at OverDrive. You can browse the collection, borrow with your library card, and enjoy reading on your computer, tablet, smartphone or eReader. Many borrowed eBooks, audiobooks and more can be enjoyed immediately in your web browser or can be downloaded using the free OverDrive app for mobile devices. Digital titles can also be enjoyed on tablets and eReader devices such as the iPad, NOOK, and Kindle. No matter how you plan to enjoy, titles will automatically expire at the end of the lending period. There are no late fees! With hundreds of popular titles to choose from, this new collection is guaranteed to have something for everyone. You can enjoy best-selling novels, the latest issues of your favorite magazines, full-length feature films and much more anytime, anywhere. To access your OverDrive account on your computer, tablet, smartphone or eReader, you'll need your library card number and password. 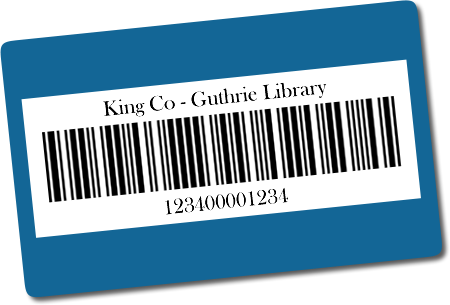 For assitance with your library card number or password, please contact Jo Ann Shipman (jshipman@guthriecsd.net) or Romy Ferguson (rferguson@guthriecsd.net). You can also call and speak to them directly (806) 596-4466.